What Makes Great Torrington Special? What Can We Do in Great Torrington? Visit Dartington Crystal, the UK’s last major glass-making factory. Explore the gardens, woods and parks at RHS Rosemoor. Shop at the Victorian pannier market. Discover Torrington’s role in the English Civil War at the town’s museum. Watch a show at Torrington’s independent venue, the Plough. Cycle or walk on the Tarka Trail. Pick up some beer from the Clearwater Brewery. Hike through Exmoor or Dartmoor. Walk a section of the Southwest Coast Path. Surf, swim and sunbathe on a sandy beach. Where Can We Stay in Great Torrington? Pitch a tent at a farm campsite or family holiday park. Stay at one of the town’s inns or bed and breakfasts. Book a self-catering holiday cottage in the town centre or surrounding countryside. Great Torrington, or simply ‘Torrington’, is a friendly market town in North Devon, on the banks of the River Torridge. Built on the site of an ancient settlement, on a cliff which towers above the river, it provides spectacular views across the surrounding countryside. Torrington lies at the heart of Tarka Country – the area described in Henry Williamson’s novel, Tarka the Otter. It is surrounded by 35 acres of ancient common land, which gives way to rolling hills, farmland and woods. With the rugged North Devon coast to its west, Exmoor to its north and Dartmoor to its south, this friendly community is a popular base for exploring the region. Torrington town centre is home to a variety of independent shops, restaurants and tearooms. There are several pubs, where good food and local ales can be enjoyed, including the Black Horse, Torrington Arms, Cavalier, Globe and Royal Exchange. The town has a small brewery, Clearwater, whose ales are served at local pubs. The Plough Arts Centre is one of the region’s best venues, with live music, film showings, exhibitions of local artists, and a bar which is a popular spot for a coffee or pre-show drink. Torrington is home to a number of striking historic landmarks, including the Victorian Pannier Market, with a stunning glass roof and a traditional market every Thursday, Friday and Saturday. At the site of a Norman Castle, there is now an excellent visitor centre, with a dramatic drop to the river below, illustrating the strategic advantage the castle had. Nearby, St Michaels and All Angels Church has a mound where the remains of 60 Civil War Royalist prisoners are said to be buried. Torrington’s important role in the English Civil War is explored at the outstanding Torrington Heritage Museum, on South Street, by the Pannier Market. Visitors to Torrington won’t want to miss Dartington Crystal, the town’s biggest employer and the UK’s only major glass-making factory. There is a restaurant, a shop selling glassware made at the factory, and the chance to see the production process in action. Nearby, Rosemoor is a beautiful collection of gardens, woods and parkland, managed by the Royal Horticultural Society. The long-distance foot and cycle path, The Tarka Trail, passes the town, and can be accessed at the former railway station. Crossing some of the region’s most picturesque countryside, the trail documents the adventures of Tarka the Otter, from Henry Williamson’s novel. During the summer, bicycles can be rented at the Puffing Billy, at the site of the old station. Torrington is a short drive from the spectacular North Devon coast, where the South West Coast Path passes sweeping, sandy bays, rocky coves and ancient fishing villages. Dartmoor is to the south, with stone circles and moorland trails, while to the north, Exmoor’s wild countryside is home to deer and wild ponies. Great Torrington’s history goes as far back as the Iron Age and medieval period, when forts and castles were built on Castle Hill. The town became strategically important during the English Civil War. The Battle of Torrington took place in 1646, when the Parliamentarians invaded, defeating Lord Hopton’s forces and bringing Royalist resistance to an end in the Westcountry. The Civil War experience, Torrington 1646, documents the town’s history. The railway line from Barnstaple to Bideford was extended to Torrington in 1872 by the London and South Western Railway. A locomotive depot was built in the town, but shut in 1959. There is now a pub, the Puffing Billy, at the side of the depot. The annual folk festival, Mayfair, has been held in Torrington since 1554. Children dance around a maypole in the town fair, electing a May Queen on the first Thursday in May. 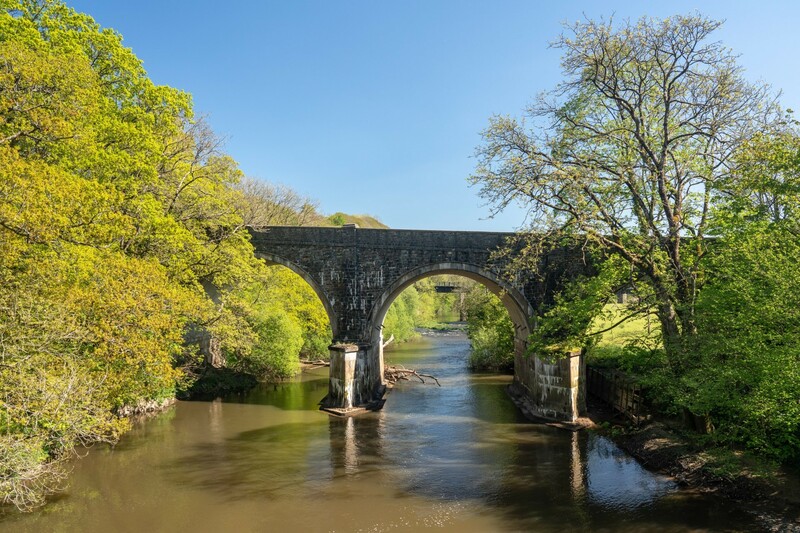 There are several historical landmarks on Torrington Common, including Taddiport Bridge and Rothern Bridge, which were the only crossings over the River Torridge until the Towns Mill Bridge was built. Rolle Road is the site of the Rolle Canal, which opened in 1827 for the transportation of clay and lime between boats on the tidal river at Landcross and Torrington’s farms, lime kilns and clay pits. The common also has a stone obelisk, built in 1818 to commemorate the Battle of Waterloo. How Do You Get to Great Torrington? Great Torrington’s nearest train station is Umberleigh, which is on the Tarka Line between Barnstaple and Exeter. There are local buses between Torrington and Barnstaple, and National Express coaches are available to locations across the UK from Barnstaple Bus Station. Exeter Airport is 48 miles from Torrington, with flights to cities across the UK, and Bristol Airport is 88 miles away with a wider range of flights. Driving to Torrington from the east, exit the A361 for South Molton and follow directions for Umberleigh and Torrington. From the west, take the A39 to Bideford and join the A386 north to Torrington, or exit the A30 onto the A386 northbound near Okehampton.